Saturn (Latin: Saturnus pronounced [saˈtʊr.nʊs]) is a god in ancient Roman religion, and a character in myth as a god of generation, dissolution, plenty, wealth, agriculture, periodic renewal and liberation. In later developments, he also came to be a god of time. His reign was depicted as a Golden Age of plenty and peace. 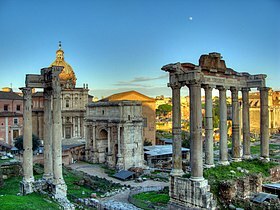 The Temple of Saturn in the Roman Forum housed the state treasury. In December, he was celebrated at what is perhaps the most famous of the Roman festivals, the Saturnalia, a time of feasting, role reversals, free speech, gift-giving and revelry. Saturn the planet and Saturday are both named after the god. The Roman land preserved the remembrance of a very remote time during which Saturn and Janus reigned on the site of the city before its foundation: the Capitol was called mons Saturnius. The Romans identified Saturn with the Greek Cronus, whose myths were adapted for Latin literature and Roman art. In particular, Cronus's role in the genealogy of the Greek gods was transferred to Saturn. As early as Livius Andronicus (3rd century BC), Jupiter was called the son of Saturn. Saturn had two mistresses who represented different aspects of the god. The name of his wife, Ops, the Roman equivalent of Greek Rhea, means "wealth, abundance, resources." The association with Ops is considered a later development, however, as this goddess was originally paired with Consus. Earlier was Saturn's association with Lua ("destruction, dissolution, loosening"), a goddess who received the bloodied weapons of enemies destroyed in war. Under Saturn's rule, humans enjoyed the spontaneous bounty of the earth without labour in the "Golden Age" described by Hesiod and Ovid. By Saturn they seek to represent that power which maintains the cyclic course of times and seasons. This is the sense that the Greek name of that god bears, for he is called Kronos, which is the same as Chronos or Time. Saturn for his part got his name because he was "sated" with years; the story that he regularly devoured his own children is explained by the fact that time devours the courses of the seasons, and gorges itself "insatiably" on the years that are past. Saturn was enchained by Jupiter to ensure that his circuits did not get out of control, and to constrain him with the bonds of the stars. According to Varro, Saturn's name was derived from satu, meaning "sowing". Even though this etymology looks implausible on linguistic grounds (for the long quantity of the a in Sāturnus and also because of the epigraphically attested form Saeturnus) nevertheless it does reflect an original feature of the god. A more probable etymology connects the name with Etruscan god Satre and placenames such as Satria, an ancient town of Latium, and Saturae palus, a marsh also in Latium. This root may be related to Latin phytonym satureia. Another epithet, variably Sterculius, Stercutus, and Sterces, referred to his agricultural functions; this derives from stercus, "dung" or "manure", referring to re-emergence from death to life. Agriculture was important to Roman identity, and Saturn was a part of archaic Roman religion and ethnic identity. His name appears in the ancient hymn of the Salian priests, and his temple was the oldest known to have been recorded by the pontiffs. Quintus Lucilius Balbus gives a separate etymology in Cicero's De Natura Deorum (On the Nature of the Gods). In this interpretation, the agricultural aspect of Saturn would be secondary to his primary relation with time and seasons. Since Time consumes all things, Balbus asserts that the name Saturn comes from the Latin word satis; Saturn being an anthropomorphic representation of Time, which is filled, or satiated, by all things or all generations. Since agriculture is so closely linked to seasons and therefore an understanding of the cyclical passage of time, it follows that agriculture would then be associated with the deity Saturn. The temple of Saturn was located at the base of the Capitoline Hill, according to a tradition recorded by Varro formerly known as Saturnius Mons, and a row of columns from the last rebuilding of the temple still stands. The temple was consecrated in 497 BC but the area Saturni was built by king Tullus Hostilius as confirmed by archaeological studies conducted by E. Gjerstad. It housed the state treasury (aerarium) throughout Roman history. The position of Saturn's festival in the Roman calendar led to his association with concepts of time, especially the temporal transition of the New Year. In the Greek tradition, Cronus was sometimes conflated with Chronus, "Time," and his devouring of his children taken as an allegory for the passing of generations. The sickle or scythe of Father Time is a remnant of the agricultural implement of Cronus-Saturn, and his aged appearance represents the waning of the old year with the birth of the new, in antiquity sometimes embodied by Aion. In late antiquity, Saturn is syncretized with a number of deities, and begins to be depicted as winged, as is Kairos, "Timing, Right Time". The figure of Saturn is one of the most complex in Roman religion. G. Dumézil refrained from discussing Saturn in his work on Roman religion on the grounds of insufficient knowledge. On the contrary, his follower Dominique Briquel has attempted a thorough interpretation of Saturn utilising Dumézil's three-functional theory of Indoeuropean religion, taking the ancient testimonies and the works of A. Brelich and G. Piccaluga as his basis. The main difficulty scholars find in studying Saturn is in assessing what is original of his figure and what is due to later hellenising influences. Moreover, some features of the god may be common to Cronus but are nonetheless very ancient and can be considered proper to the Roman god, whereas others are certainly later and arrived after 217 BC, the year in which the Greek customs of the Kronia were introduced into the Saturnalia. the location of his cult on the Capitol, which goes back to remote times. Dumézil postulated a split of the figure of the sovereign god in Indoeuropean religion, which is embodied by Vedic gods Varuna and Mitra. Of the two, the first one shows the aspect of the magic, uncanny, awe inspiring power of creation and destruction, while the second shows the reassuring aspect of guarantor of the legal order in organised social life. Whereas in Jupiter these double features have coalesced, Briquel sees Saturn as showing the characters of a sovereign god of the Varunian type. His nature becomes evident in his mastership over the annual time of crisis around the winter solstice, epitomised in the power of subverting normal codified social order and its rules, which is apparent in the festival of the Saturnalia, in the mastership of annual fertility and renewal, in the power of annihilation present in his paredra Lua, in the fact that he is the god of a timeless era of plenty and bounty before time, which he reinstates at the time of the yearly crisis of the winter solstice. Also, in Roman and Etruscan reckoning Saturn is a wielder of lightning; no other agricultural god (in the sense of specialized human activity) is one. Hence the mastership he has on agriculture and wealth cannot be that of a god of the third function, i.e. of production, wealth, and pleasure, but it stems from his magical lordship over creation and destruction. Although these features are to be found in Greek god Cronus as well, it appears that those features were proper to Roman Saturn's most ancient aspects, such as his presence on the Capitol and his association with Jupiter, who in the stories of the arrival of the Pelasgians in the land of the Sicels and that of the Argei orders human sacrifices to him. Sacrifices to Saturn were performed according to "Greek rite" (ritus graecus), with the head uncovered, in contrast to those of other major Roman deities, which were performed capite velato, "with the head covered." Saturn himself, however, was represented as veiled (involutus), as for example in a wall painting from Pompeii that shows him holding a sickle and covered with a white veil. This feature is in complete accord with the character of a sovereign god of the Varunian type and is common with German god Odin. Briquel remarks Servius had already seen that the choice of the Greek rite was due to the fact that the god himself is imagined and represented as veiled, thence his sacrifice cannot be carried out by a veiled man: this is an instance of the reversal of the current order of things typical of the nature of the deity as appears in its festival. Plutarch writes his figure is veiled because he is the father of truth. Pliny notes that the cult statue of Saturn was filled with oil; the exact meaning of this is unclear. Its feet were bound with wool, which was removed only during the Saturnalia. The fact that the statue was filled with oil and the feet were bound with wool may relate back to the myth of "The Castration of Uranus". In this myth Rhea gives Cronus a rock to eat in Zeus' stead, thus tricking Cronus. Although mastership of knots is a feature of Greek origin it is also typical of the Varunian sovereign figure, as apparent e.g. in Odin. Once Zeus was victorious over Cronus, he sets this stone up at Delphi and constantly it is anointed with oil and strands of unwoven wool are placed on it. It wore a red cloak, and was brought out of the temple to take part in ritual processions and lectisternia, banquets at which images of the gods were arranged as guests on couches. All these ceremonial details identify a sovereign figure. Briquel concludes that Saturn was a sovereign god of a time that the Romans perceived as no longer actual, that of the legendary origins of the world, before civilization. Little evidence exists in Italy for the cult of Saturn outside Rome, but his name resembles that of the Etruscan god Satres. The potential cruelty of Saturn was enhanced by his identification with Cronus, known for devouring his own children. He was thus used in translation when referring to gods from other cultures the Romans perceived as severe; he was equated with the Carthaginian god Baal Hammon, to whom children were sacrificed, and to Yahweh, whose Sabbath was referred to as Saturni dies, "Saturn's day," in a poem by Tibullus, who wrote during the reign of Augustus; eventually this gave rise to the word "Saturday" in English. The identification with Ba'al Hammon later gave rise to the African Saturn, a cult that enjoyed great popularity until the 4th century. It had a popular but also a mysteric character and required child sacrifices. It is also considered as inclining to monotheism. 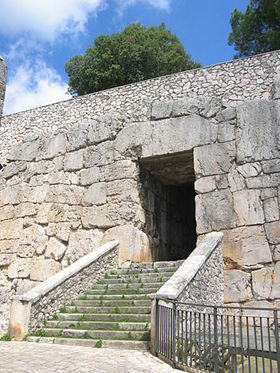 In the ceremony of initiation the myste intrat sub iugum, ritual that Leglay compares to the Roman tigillum sororium. Even though their origin and theology are completely different the Italic and the African god are both sovereign and master over time and death, fact that has permitted their encounter. Moreover, here Saturn is not the real Italic god but his Greek counterpart Cronus. Saturn is associated with a major religious festival in the Roman calendar, Saturnalia. Saturnalia celebrated the harvest and sowing, and ran from December 17–23. During Saturnalia, the social restrictions of Rome were relaxed. The figure of Saturn, kept during the year with its legs bound in wool, was released from its bindings for the period of the festival. The revelries of Saturnalia were supposed to reflect the conditions of the lost "Golden Age" before the rule of Saturn was overthrown, not all of them desirable except as a temporary release from civilized constraint. The Greek equivalent was the Kronia. Macrobius (5th century AD) presents an interpretation of the Saturnalia as a festival of light leading to the winter solstice. The renewal of light and the coming of the new year was celebrated in the later Roman Empire at the Dies Natalis of Sol Invictus, the "Birthday of the Unconquerable Sun," on December 25. It was customary for the Romans to represent divine figures as kings of Latium at the time of their legendary origins. Macrobius states explicitly that the Roman legend of Janus and Saturn is an affabulation, as the true meaning of religious beliefs cannot be openly expressed. In the myth Saturn was the original and autochthonous ruler of the Capitolium, which had thus been called the Mons Saturnius in older times and on which once stood the town of Saturnia. He was sometimes regarded as the first king of Latium or even the whole of Italy. At the same time, there was a tradition that Saturn had been an immigrant god, received by Janus after he was usurped by his son Jupiter and expelled from Greece. In Versnel's view his contradictions—a foreigner with one of Rome's oldest sanctuaries, and a god of liberation who is kept in fetters most of the year—indicate Saturn's capacity for obliterating social distinctions. The Golden Age of Saturn's reign in Roman mythology differed from the Greek tradition. He arrived in Italy "dethroned and fugitive," but brought agriculture and civilization for which he was rewarded by Janus with a share of the kingdom, becoming himself king. As the Augustan poet Virgil described it, "He gathered together the unruly race" of fauns and nymphs "scattered over mountain heights, and gave them laws ... . Under his reign were the golden ages men tell of: in such perfect peace he ruled the nations." He was considered the ancestor of the Latin nation as he fathered Picus, the first king of Latium, who married Janus' daughter Canens and in his turn fathered Faunus. Saturn was also said to have founded the five Saturnian towns of Latium: Aletrium (today Alatri), Anagnia (Anagni), Arpinum (Arpino), Atina and Ferentinum (Ferentino, also known as Antinum) all located in the Latin Valley, province of Frosinone. All these towns are surrounded by cyclopical walls; their foundation is traditionally ascribed to the Pelasgians. But Saturn also had a less benevolent aspect, as indicated by the blood shed in his honor during gladiatorial munera. His consort in archaic Roman tradition was Lua, sometimes called Lua Saturni ("Saturn's Lua") and identified with Lua Mater, "Mother Destruction," a goddess in whose honor the weapons of enemies killed in war were burned, perhaps as expiation. H.S. Versnel, however, proposed that Lua Saturni should not be identified with Lua Mater, but rather refers to "loosening"; she thus represents the liberating function of Saturn. Saturn's chthonic nature connected him to the underworld and its ruler Dis Pater, the Roman equivalent of Greek Plouton (Pluto in Latin) who was also a god of hidden wealth. In 3rd-century AD sources and later, Saturn is recorded as receiving gladiatorial offerings (munera) during or near the Saturnalia. These gladiator combats, ten days in all throughout December, were presented by the quaestors and sponsored with funds from the treasury of Saturn. The practice of gladiatorial munera was criticized by Christian apologists as a form of human sacrifice. Although there is no evidence of this practice during the Republican era, the offering of gladiators led to later theorizing that the primeval Saturn had demanded human victims. Macrobius says that Dis Pater was placated with human heads and Saturn with sacrificial victims consisting of men (virorum victimis). The figurines that were exchanged as gifts (sigillaria) during the Saturnalia may have represented token substitutes. In 104 BC, the plebeian tribune Lucius Appuleius Saturninus issued a denarius depicting Saturn driving a four-horse chariot (quadriga), a vehicle associated with rulers, triumphing generals, and sun gods. Saturninus was a popularist politician who had proposed reduced-price grain distribution to the poor of Rome. The head of the goddess Roma appears on the obverse. The Saturnian imagery played on the tribune's name and his intent to alter the social hierarchy to his advantage by basing his political support on the common people (plebs) rather than the senatorial elite. ^ B. Liou Gilles "Naissance de la ligue latine. Mythe et cult de fondation" in Revue belge de philologie et d' histoire 74 1. pp. 73–97: 75. doi:10.3406/rbph.1996.4096. Citing Festus s.v. Saturnia p. 430 L: "Saturnia Italia, et mons, qui nunc est Capitolinus, Saturnius appellabatur, quod in tutela Saturni esse existimantur. Saturnii quoque dicebantur, qui castrum in imo clivo Capitolino incolebant, ubi ara diacata ei deo ante bellum troianum videtur." And Ovid "Fasti" 6, 31: "A patre dicta meo quondam Saturnia Roma est". ^ Saturni filius, frg. 2 in the edition of Baehrens. ^ Hans Friedrich Mueller, "Saturn," Oxford Encyclopedia of Ancient Greece and Rome (Oxford University Press, 2010), p. 222. ^ G. Dumézil p. 244. ^ G. Dumézil "Lua Mater" in Déesses latines et mythes védiques Bruxelles 1968 1959 pp. 98–115. D. compared this Roman figure with Indian deity Nírŗti. ^ Cicero, Marcus Tullius; Walsh, P.G. (2008). The Nature of the Gods (Reissue. ed.). Oxford: Oxford University Press. pp. 69–70. ISBN 978-0-19-954006-8. ^ Varro, De lingua latina 5.64. ^ CIL I 2nd 449. ^ G. Alessio "Genti e favelle dell' antica Apulia" Taranto Cressati 1949 = Archivio Storico Pugliese 1949 II 1 p. 14. ^ Frederick Kaufman in Harper's Magazine, February 2008: Wasteland. A journey through the American cloaca. ^ Festus, De verborum significatu 432L. ^ Varro Lingua Latina V 52. ^ a b Mueller, "Saturn," p. 222. ^ In Mélanges A. Grenier Bruxelles 1962 pp. 757-762 as cited by Briquel p. 141. ^ Samuel L. Macy, entry on "Father Time," in Encyclopedia of Time (Taylor & Francis, 1994), pp. 208–209. ^ G. Dumézil La religion romain archaïque Paris 1974 part I chap. 5; Italian translation Milan 1977 p. 244-245. ^ D. Briquel "Jupiter, Saturn et le Capitol. Essai de comparaison indoeuropéenne" in Revue de l' histoire des religions 198 2 1981 pp. 131-162. A. Brelich Tre variazioni romane sul tema delle origini Roma 1956. G. Piccaluga Terminus Roma 1974. ^ Briquel 1981 pp. 142 ff. ^ Macrobius Saturnalia I 7. Cited by Briquel above p. 143. ^ Iuventas shows a clear Varunian character in the liaison of Romulus with the iuvenes the young soldiers; Terminus has a Mitran character even though he shows Varunian traits in allowing the enlargement of the borders (propagatio finium): Briquel p. 134 n. 8. ^ G. Dumézil Mitra-Varuna Paris 1940; Les dieux souverains des Indo-Europééens Paris 1977. ^ Briquel p. 151 citing Pliny II 138–139; Servius Ad Aeneidem I 42; XI 259. Saturn's lightningbolts are those of wintertime. ^ Ovid Fasti V.621–662, particularly 626–629. ^ Briquel p. 148 who cites Servius Ad Aenaeidem III 407. ^ Briquel p. 148 n. 63 who cites Plutarch Quaestiones Romanae II. ^ Pliny, Natural History 15.32. ^ a b Macrobius, Saturnalia 1.8.5. ^ Tertullian, De testimonio animae 2. ^ Dionysius of Halicarnassus, Antiquitates Romanae 7.72.13. ^ Found on the Piacenza Liver; see also Martianus Capella 1.58. Mueller, "Saturn," p. 222. ^ Mueller, "Saturn," p. 221. ^ M. Leglay Saturn africaine. Histoire Paris BEFRA 1966. ^ William F. Hansen, Ariadne's Thread: A Guide to International Tales Found in Classical Literature (Cornell University Press, 2002), p. 385. ^ Macrobius, Saturnalia 1.1.8–9; Jane Chance, Medieval Mythography: From Roman North Africa to the School of Chartres, A.D. 433–1177 (University Press of Florida, 1994), p. 71. ^ see Robert A. Kaster, Macrobius: Saturnalia, Books 1–2 (Loeb Classical Library, 2011), note on p. 16. ^ Macrobius Saturnalia I 7, 18. ^ Varro Lingua Latina V 42 and 45; Vergil Aeneis VIII 357-8; Dionysius of Halicarnassus Roman Antiquities I 34; Festus p. 322 L; Macrobius Sat. I 7, 27 and I 10, 4; Pliny the Elder Natural History III 68; Minucius Felix Octavius 22; Tertullian Apologeticum 10 as cited by Briquel p. 154. ^ Versnel, "Saturnus and the Saturnalia," pp. 138–139. ^ Versnel, "Saturnus and the Saturnalia," p. 139. The Roman theologian Varro listed Saturn among the Sabine gods. ^ Versnel, "Saturnus and the Saturnalia," pp. 139, 142–143. ^ Versnel, "Saturnus and the Saturnalia," p. 143. ^ Virgil, Aeneid 8.320–325, as cited by Versnel, "Saturnus and the Saturnalia," p. 143. ^ Mario Pincherle, Giuliana C. Volpi: La civiltà minoica in Italia. Le città saturnie Pisa Pacini 1990. ^ Mueller, "Saturn," in The Oxford Encyclopedia of Ancient Greece and Rome, p. 222. ^ Versnel, "Saturnus and the Saturnalia," p. 144. ^ H.S. Versnel, "Saturnus and the Saturnalia," in Inconsistencies in Greek and Roman Religion: Transition and Reversal in Myth and Ritual (Brill, 1993, 1994), pp. 144–145. See also the Etruscan god Satre. ^ For instance, Ausonius, Eclogue 23 and De feriis Romanis 33–7. See Versnel, "Saturnus and the Saturnalia," pp. 146 and 211–212, and Thomas E.J. Wiedemann, Emperors and Gladiators (Routledge, 1992, 1995), p. 47. ^ Eight days were subsidized from the Imperial treasury (arca fisci), and two mostly by the sponsoring magistrate himself; Michele Renee Salzman, On Roman Time: The Codex-Calendar of 354 and the Rhythms of Urban Life in Late Antiquity (University of California Press, 1990), p. 186. ^ Mueller, "Saturn," in The Oxford Encyclopedia of Ancient Greece and Rome, p. 222; Versnel, "Saturnus and the Saturnalia," p. 146. ^ Macrobius, Saturnalia 1.7.31; Versnel, "Saturnus and the Saturnalia," p. 146. ^ Macrobius, Saturnalia 1.10.24; Carlin A. Barton, The Sorrows of the Ancient Romans: The Gladiator and the Monster (Princeton University Press, 1993), p. 166. For other Roman practices that may represent substitutes for human sacrifice, see Argei and oscilla, the latter of which were used also at the Latin Festival and the Compitalia: William Warde Fowler, The Roman Festivals of the Period of the Republic (London, 1908), p. 272. ^ Versnel, "Saturnus and the Saturnalia," p. 162. Georges Dumézil La religion romaine archaïque Paris Payot 1974 2nd; Italian translation (expanded version) La religione romana arcaica Milano Rizzoli 1977. Edizione e traduzione a cura di Furio Jesi. Dominique Briquel "Jupiter, Saturn et le Capitol. Essai de comparaison indoeuropéenne" in Revue de l' histoire des religions 198 2. 1981 pp. 131–162. Marcel Leglay Saturn africain. Histoire BEFAR Paris de Boccard 1966. H.S. Versnel, "Saturnus and the Saturnalia," in Inconsistencies in Greek and Roman Religion: Transition and Reversal in Myth and Ritual (Brill, 1993, 1994), pp. 144–145. Wikimedia Commons has media related to Saturnus (deus). Wikisource has the text of the 1911 Encyclopædia Britannica article Saturn (god). (in English) (in Latin) Flowers of Abu Ma'shar by Ja‘far ibn Muḥammad al-Balkhī depicts and discusses Saturn and his role within astrology, dating from the 9th century. This page was last edited on 21 April 2019, at 17:56 (UTC).